That’s what I named it because the whole time Jim was assembling it, he GRUMBLED! 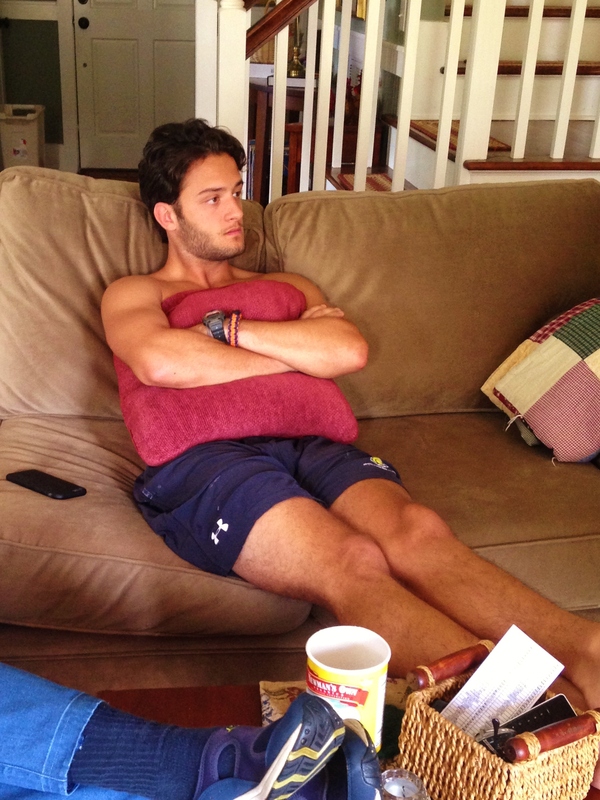 (He cussed a little too.) 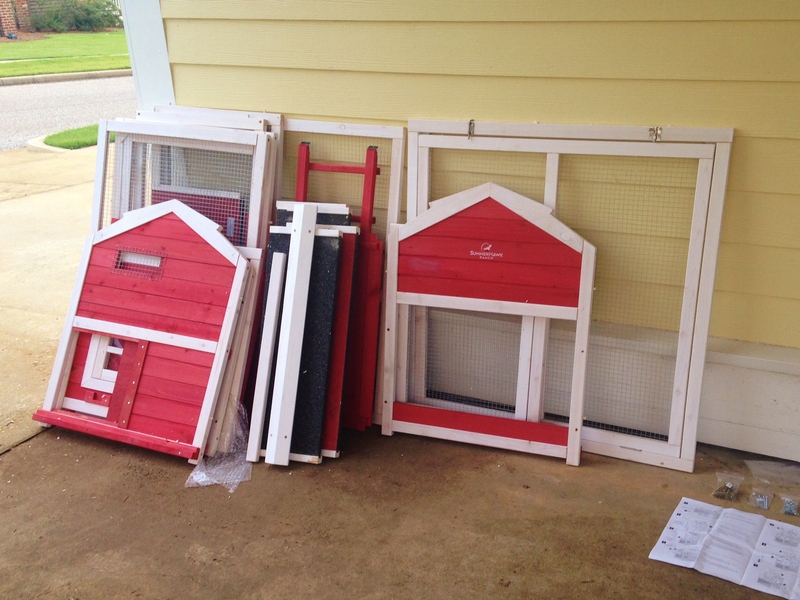 Basically any pre-fab chicken coop is not going to measure up to his exacting standards. 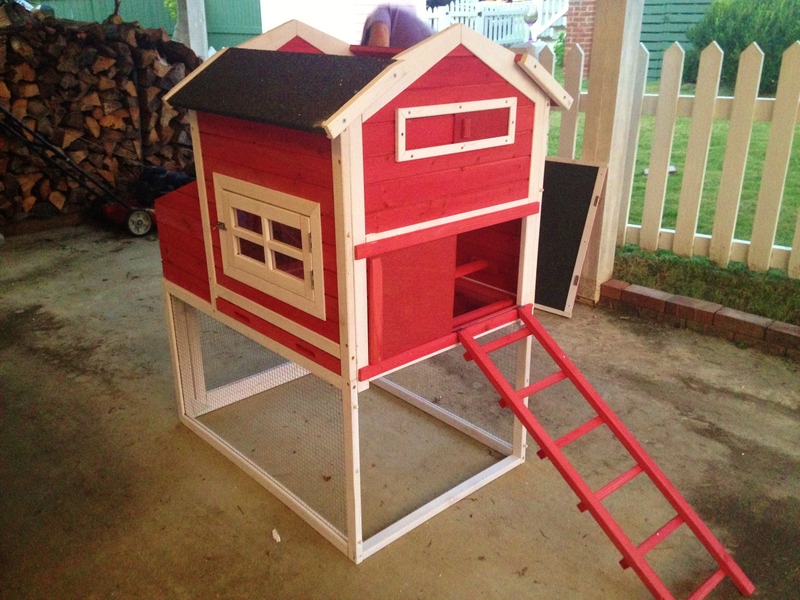 He really wanted to build a nice coop for Daisy, but the boy is tasked up the wazoo and frankly I didn’t want to keep a chicken in my living room until 2016. 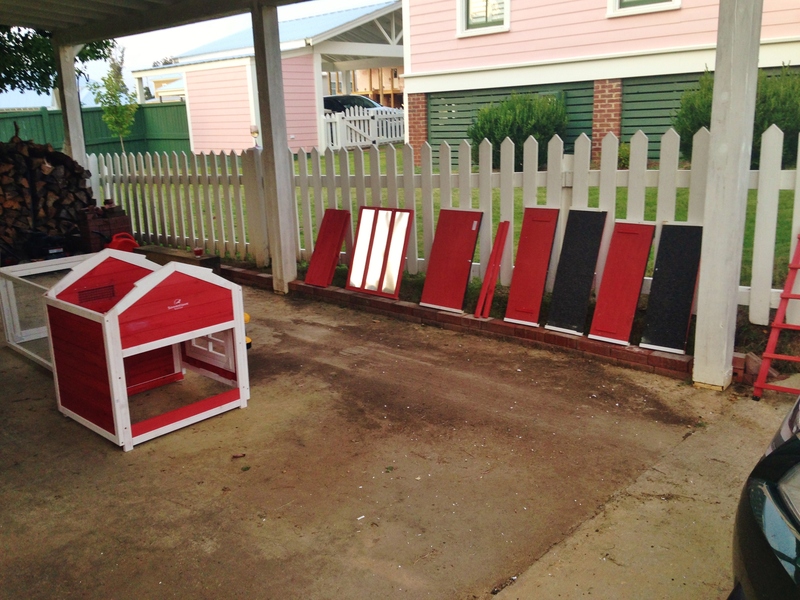 Although I did my research to find a nice house for my sweet chicken, I have to admit that it is a far cry from the palace he built in 2011 for Rosie, Daisy & Violet. Go here to see that work of art! 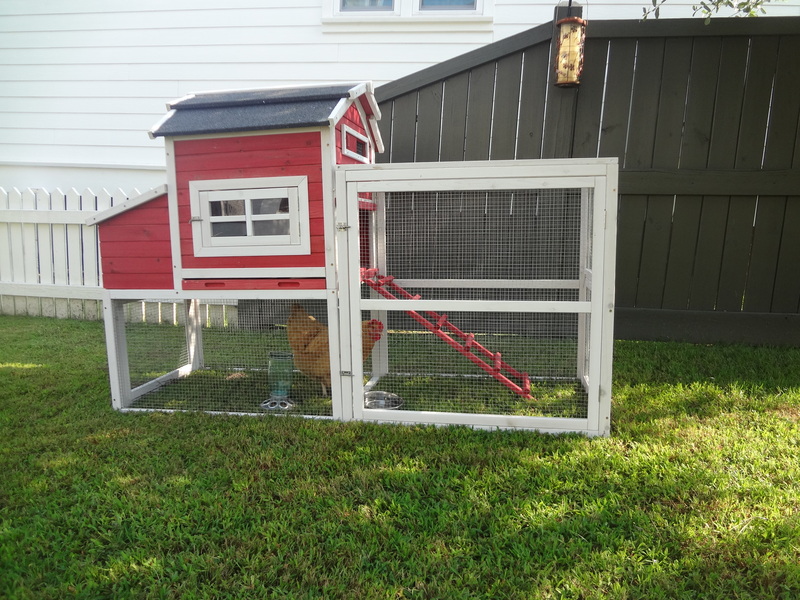 Well, I think this little coop is very cute and functional and Jim can just “scratch his mad place”. I was going to attempt construction myself until I unloaded all the parts! 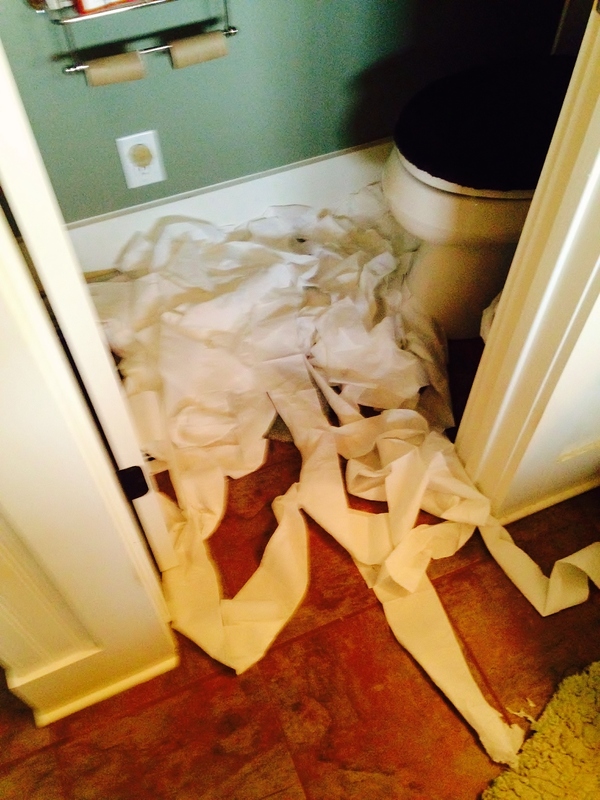 I was ordered to stay out of his way, but I did find something constructive to do while I watched the assembly. He wouldn’t even let me take any pictures of him building it! I put all the parts in order by letter and number. I’m sure this was a tremendous help. See! It’s adorable right? Jim is going to reinforce a few things, and we need to make the ladder easier for her to climb but otherwise it’s a fine place for Daisy to sleep and hang out in when we’re not home. She spent her first night in here last night and although she has a little roost inside the loft, she prefers to sleep in the nest box. 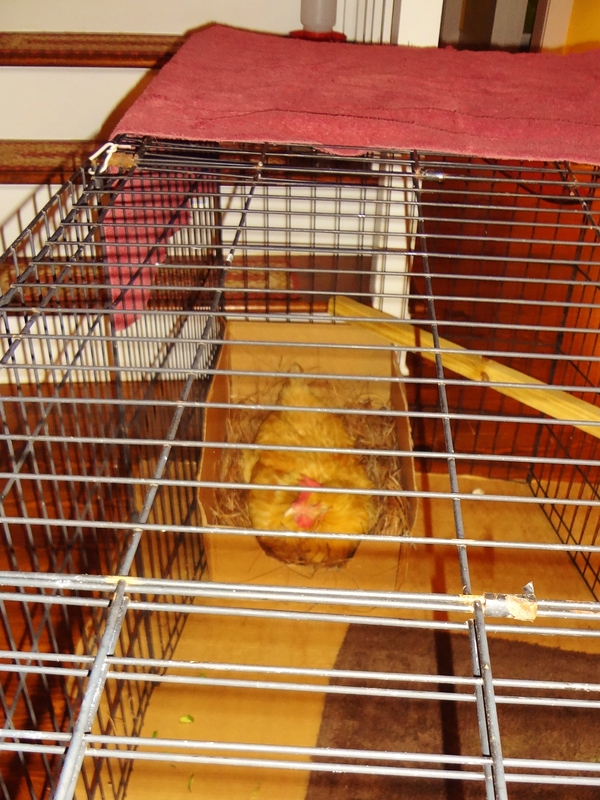 Leave it to my smart chicken to find a better way to get her ZZZZZZZZZZZZZZZs. I always wondered why chickens hung on to a perch all night with their feet when they could just snuggle into a nest box instead. 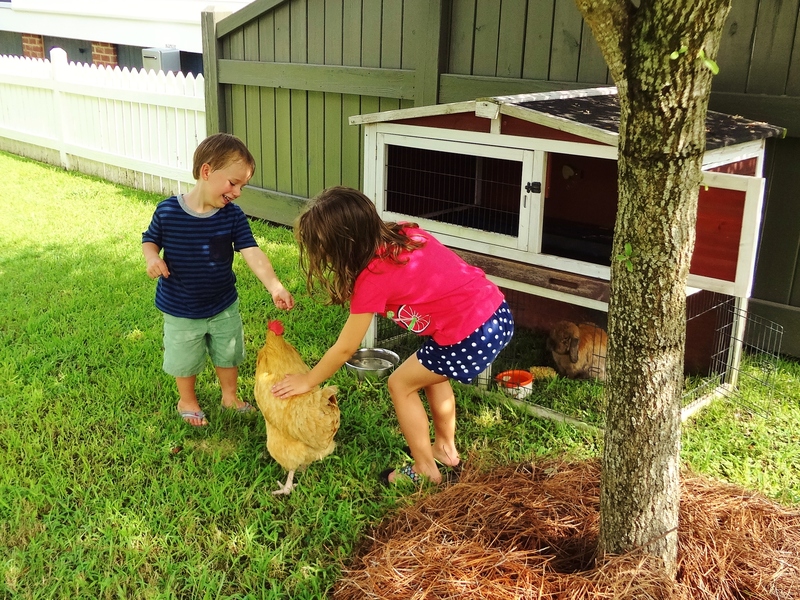 I’ll share some photos of two sweet kids who have lived next door for almost two months. Christian and Adeline have been my little tenants in the Pink House and they are leaving on a new adventure this week. Their dad is in the Air Force and the family is in transition while he trains for a new assignment. Their mom Jennifer stayed behind with the kids to finish a masters degree. Whew! I’m tired just THINKING about that! Buster has learned how to hide when he’s not in the mood for company. It’s been fun having them next door, but I must admit I’m excited to have my Pink House to play in this weekend. I have a few small improvements to make inside and I’ll make sure to show updated pictures when I’m through. 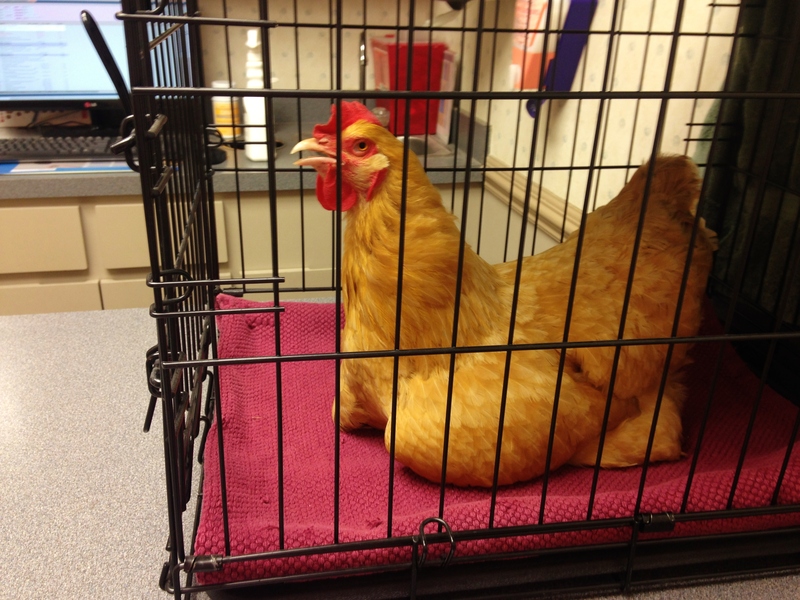 Daisy is almost well, but we have about 4 more days of antibiotics until she has a clean bill of health. Her breathing is almost normal but during the worst heat of the day she comes inside to rest in her enclosure. But when she’s outside, boy does she make the most of it! Check her out taking a dust bath in the back yard. …and this. What? I’m a chicken! It’s OK Daisy girl. 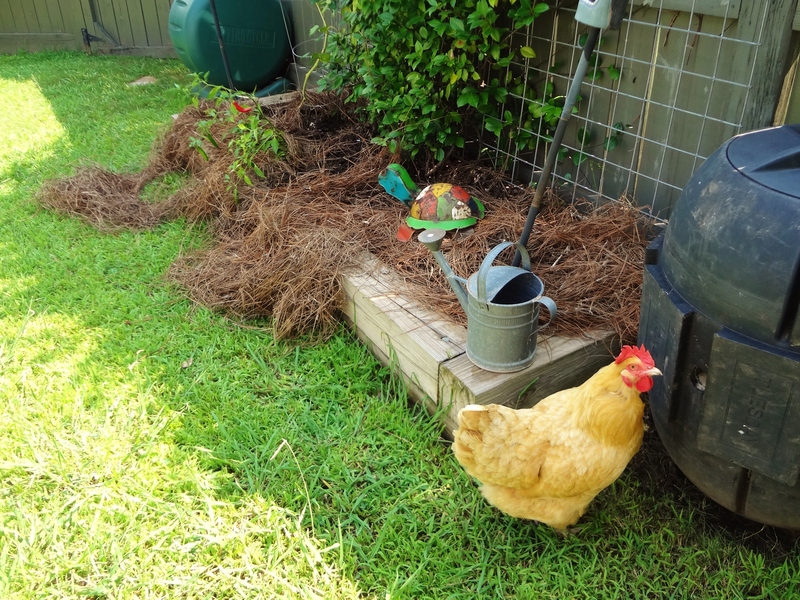 I’m going to commandeer Buster’s herb garden so you can create your own “chicken-spa” area. It’s OK Buster, I can buy you herbs at the Piggly Wiggly! A few folks have asked if Scrappy is happy with her new home and new mommy. 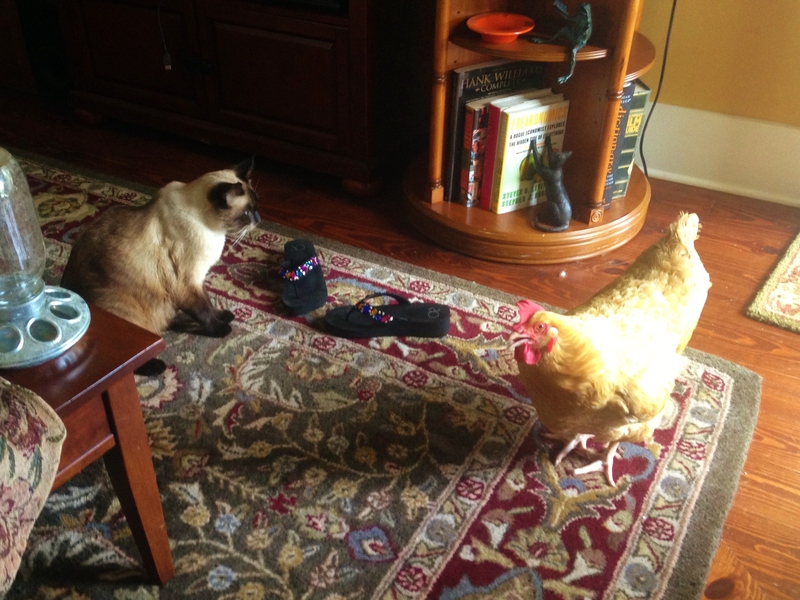 Yes, the kittybunnychicken is a bit “chicken” obsessed at the moment. Indulge me while I revel in having a sweet chicken again! I mean really…just look at her! 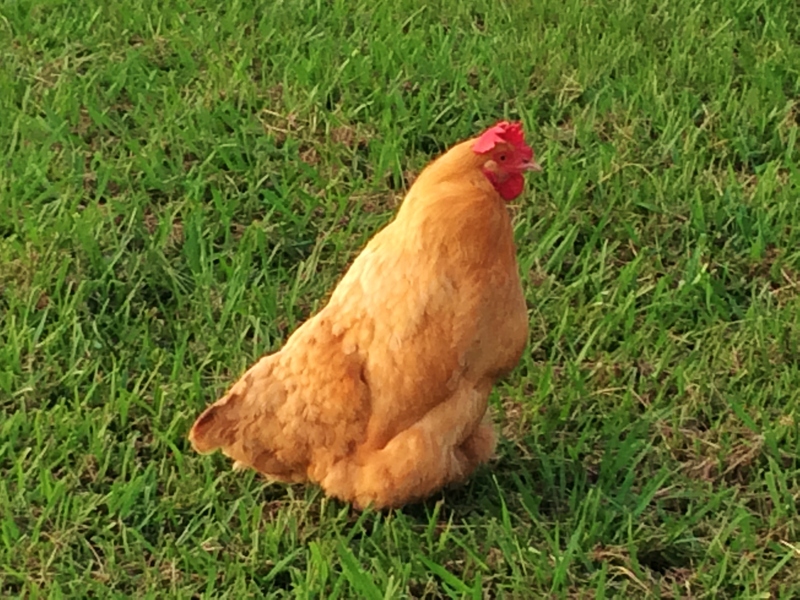 Wouldn’t you want to CROW about your pet if she were this pretty! 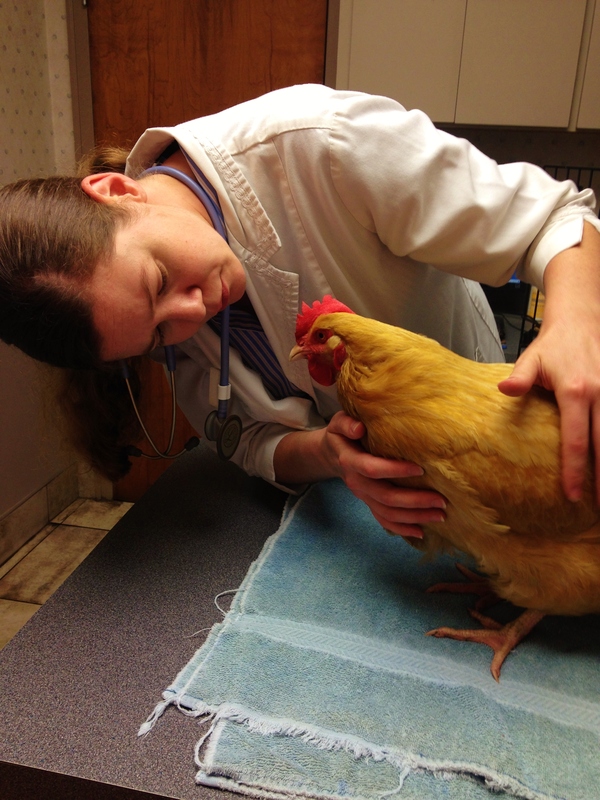 I took Daisy to the vet last week and Dr. Glasscock gave her a thorough examination. 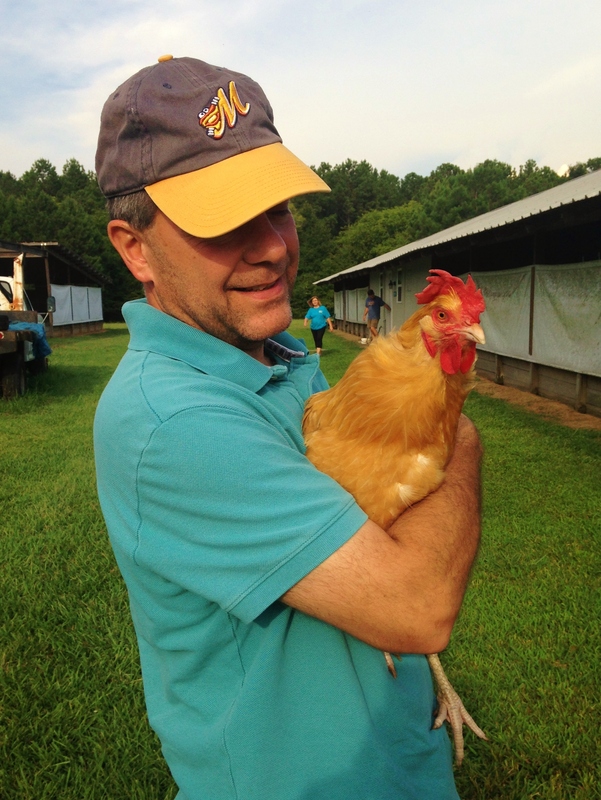 This is not the first time Dr. Glasscock has looked out for my little yellow girl. 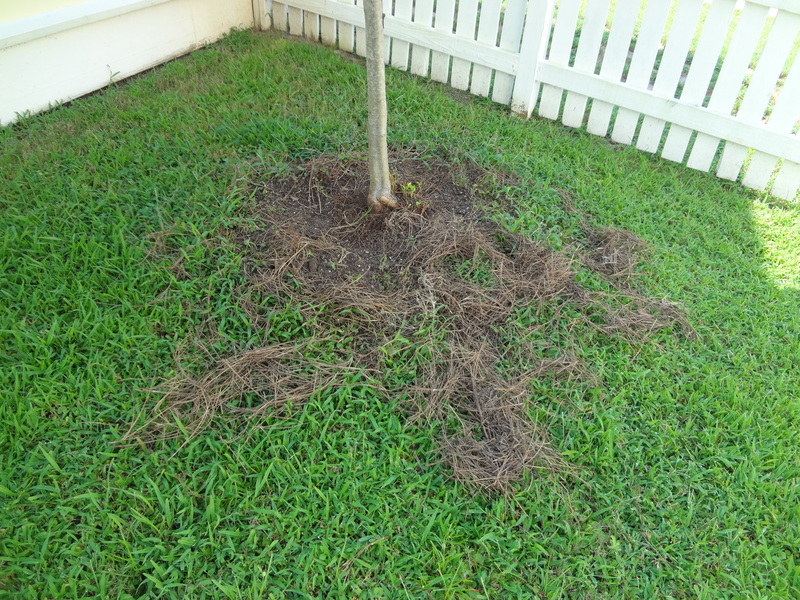 In May of 2011 Daisy was attacked by a feral cat and almost died. Dr. G did surgery on her and kept her at the vet for a couple of days. Daisy survived and the only lasting effects are a very funny walk and an eye that won’t open all the way. 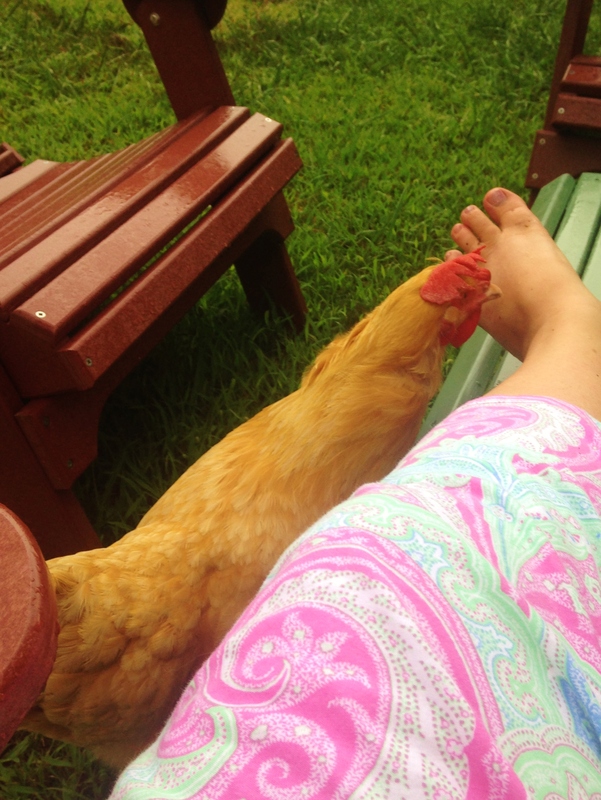 If you’d like to read that saga you can go here to my old blog mychickendiary. 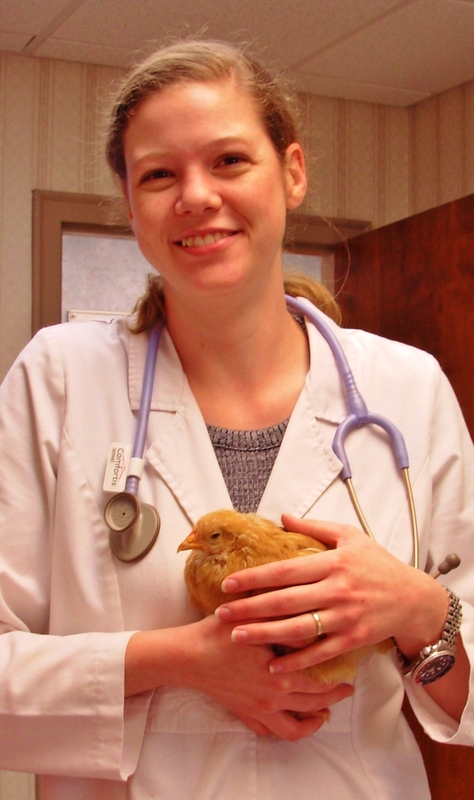 She took a guess that Daisy had trachea worms which cause the throat to swell making it hard to breathe. She suggested keeping her indoors while she recovered and she gave us two meds to give her every day. 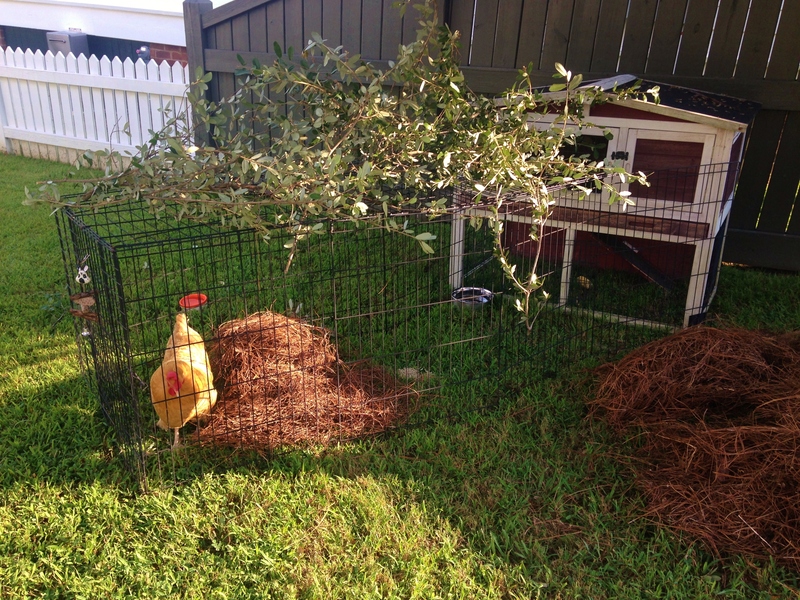 Jim rigged up an indoor “coop” for her out of some dog fencing that my pal Susna gave us. 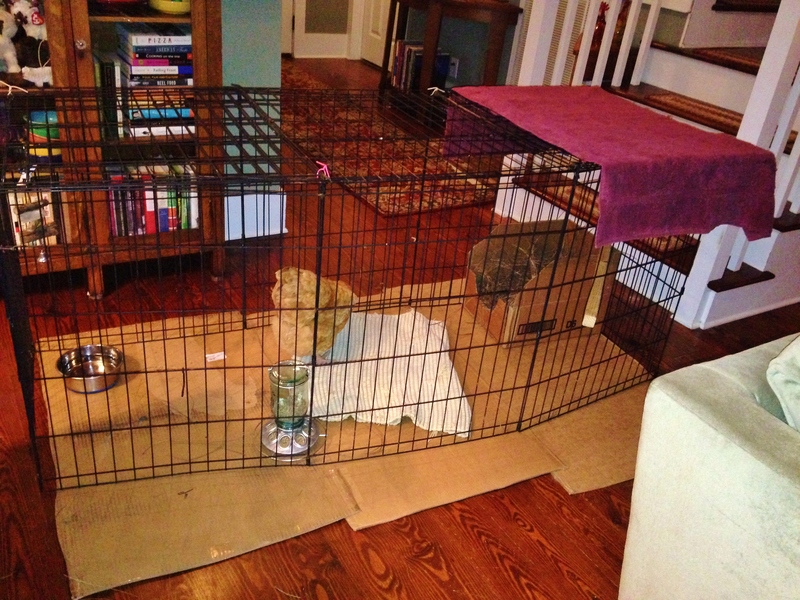 We’ve used that fencing a million times for different foster pets and it really came in handy for Daisy’s indoor house. Not pretty, but it does the job. 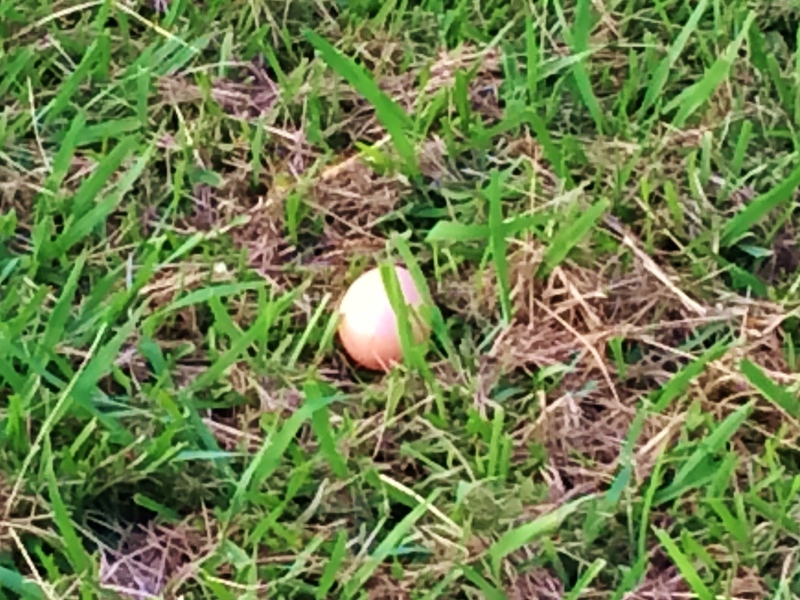 She has a nice nest box, but a couple of days ago, she decided to lay an egg right out in the yard. 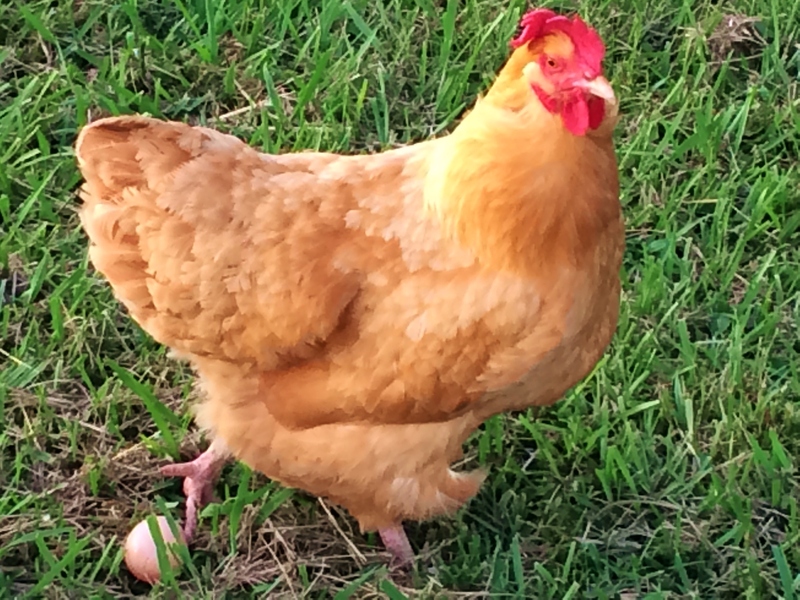 Most chickens prefer to lay their eggs in a quiet, dark place, but our girl doesn’t want to waste any outdoor time so she just made a speedy delivery instead. She’s also getting lots of treats to speed her recovery. The girl can go to town on some corny cobb! If the weather is cool enough and I have to leave the house for a bit, we also have a nice area outside where we can let her play in safety. 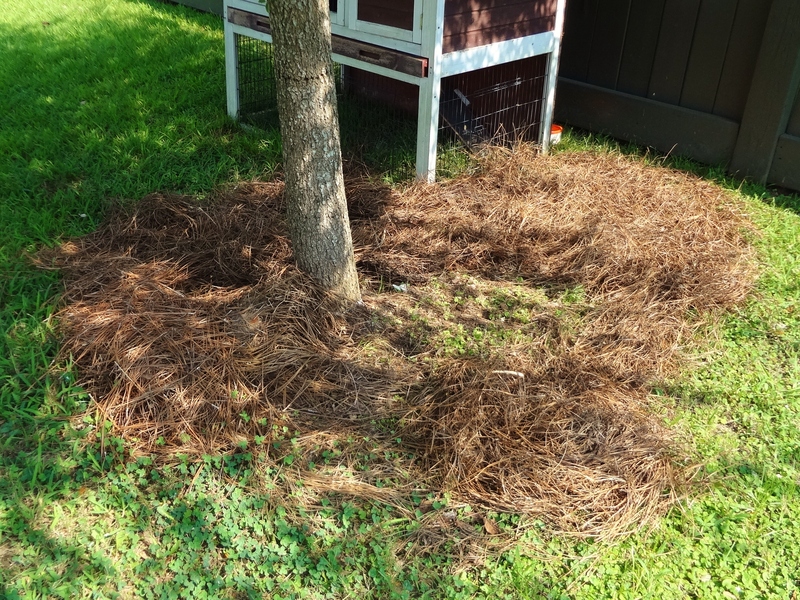 I used some oak tree trimmings to make a shady canopy. I have way too much time on my hands. I just heard from the Goodwin Animal Hospital that Daisy’s “sample” did reveal that she has a trachea worm. This means the meds Dr. G already gave us are working and that Daisy is on the road to recovery. 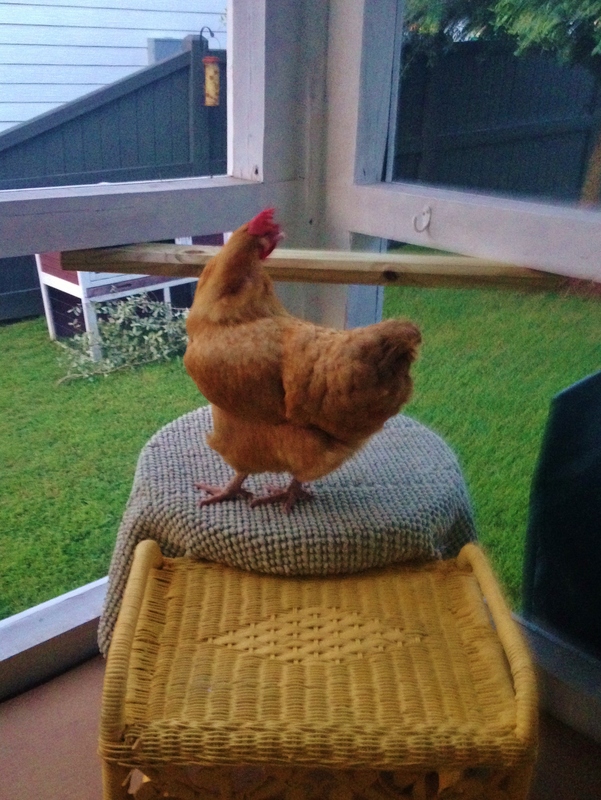 We ordered a nice chicken coop for her and it should arrive soon. 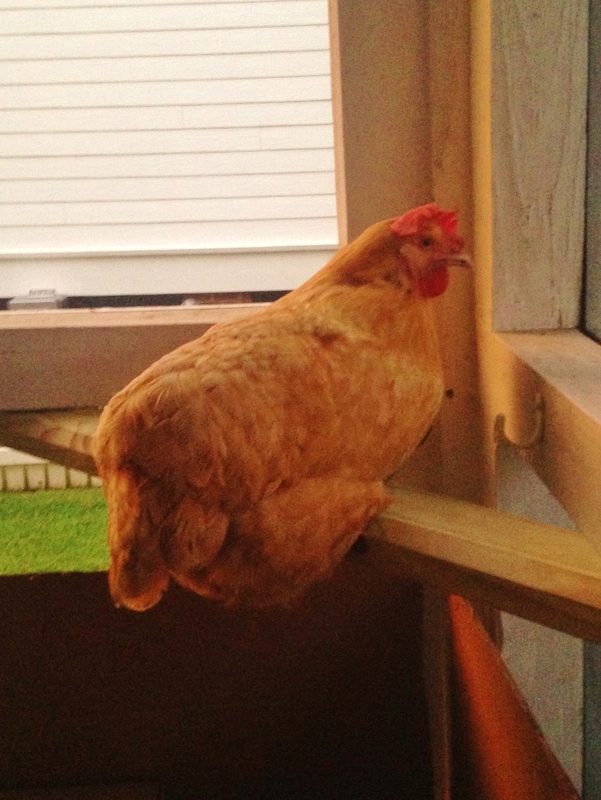 When the heat breaks, she can be livin’ large outside like a proper urban chicken! I need to thank my dear pal Debbie for letting me take this girl home again. I know you miss her my friend, but I am so happy to have her back. Come visit! No, never fear–I don’t intend to toot my flute and lead your children off a cliff. 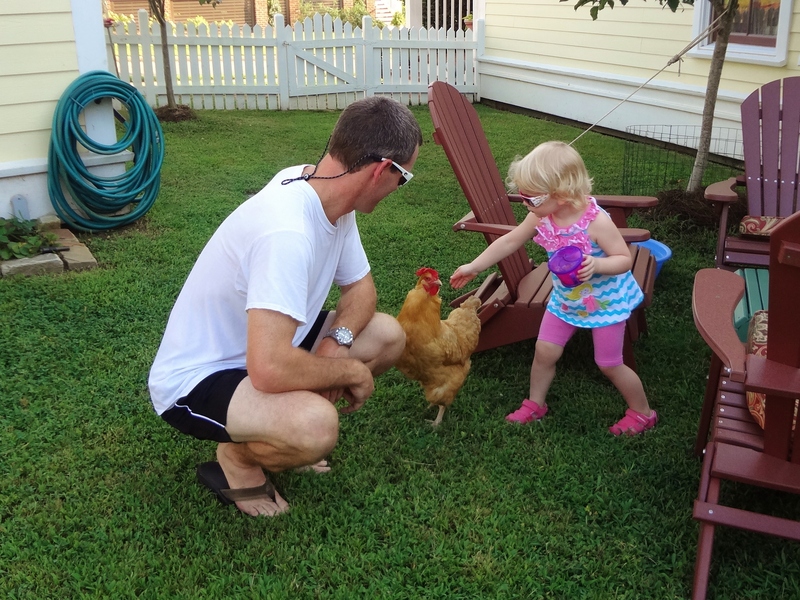 But when you have a pet chicken in your back yard, the children will come. 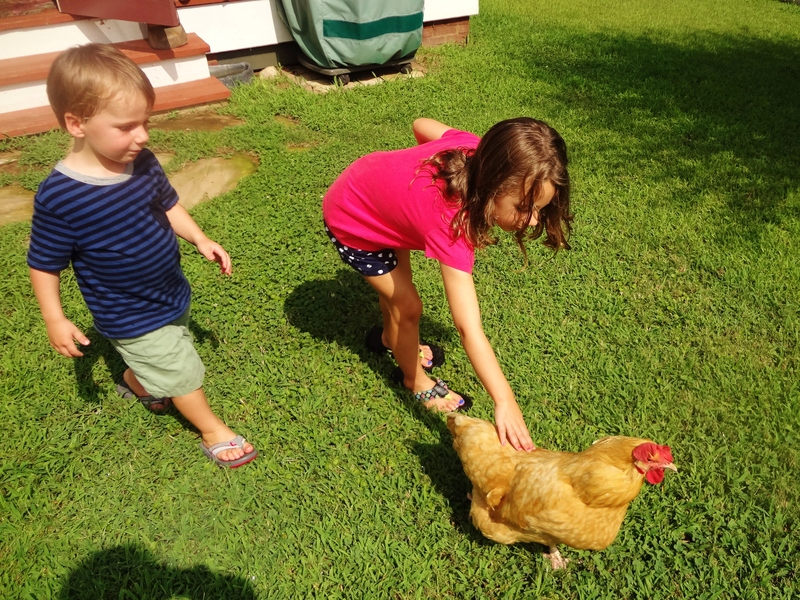 This kid is fearless and normally I’d be happy to let her chase my chicken around my yard, but since Daisy is sick I asked her to refrain this time. 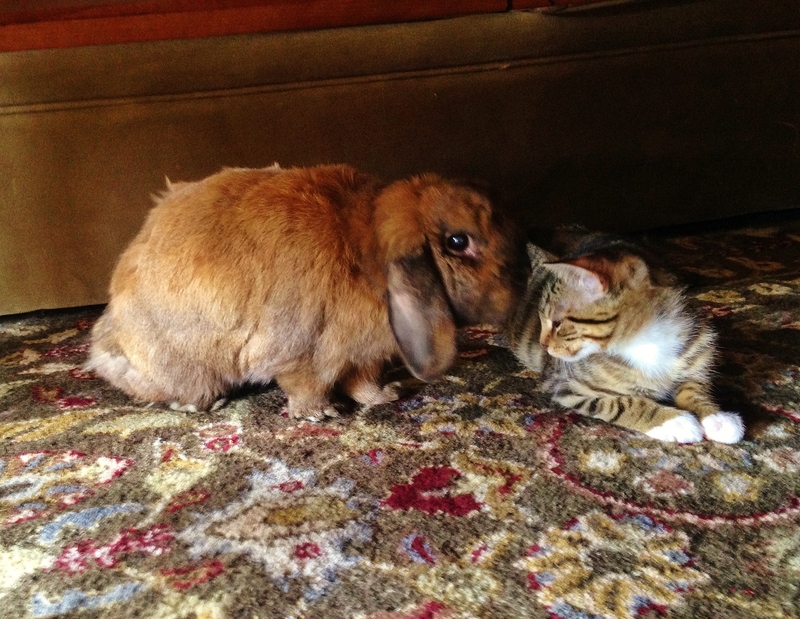 She complied and offered Daisy some of her tasty snacks. 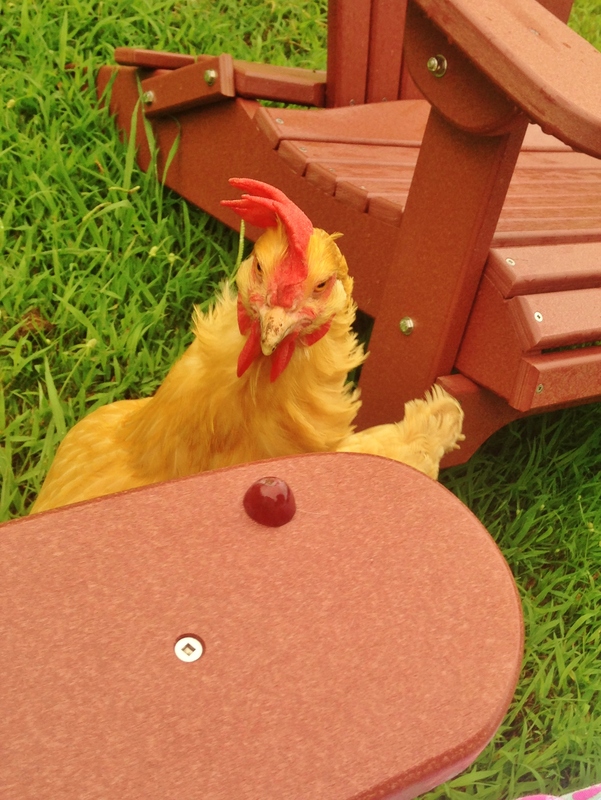 Who knew chickens like Cheerios? 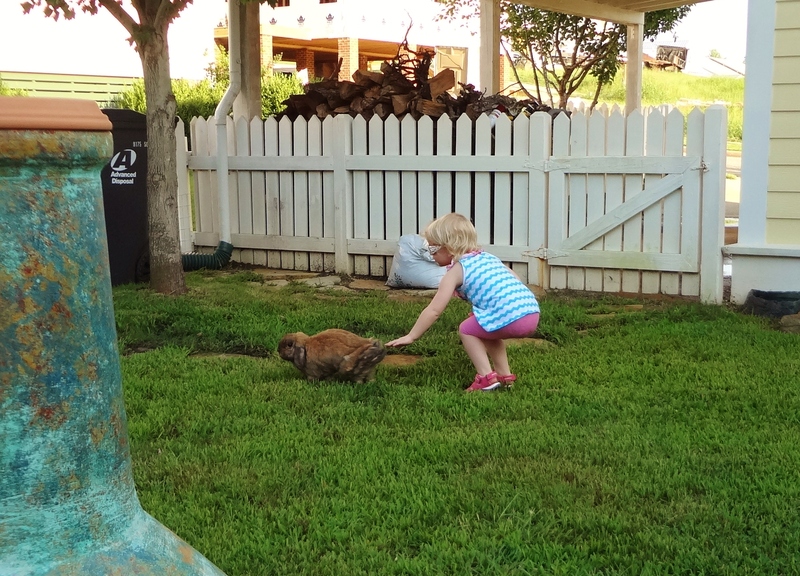 She did have a question about the weird little brown guy in the yard. Can I chase this bunny? Daisy had her vet appointment with Dr. Glasscock yesterday, but I’ll elaborate on that later. For the time being, just know that Daisy is under excellent treatment and we’re doing what we can to get her well. For now she stays inside if the temp is above 80 but she does sleep on the porch at night. 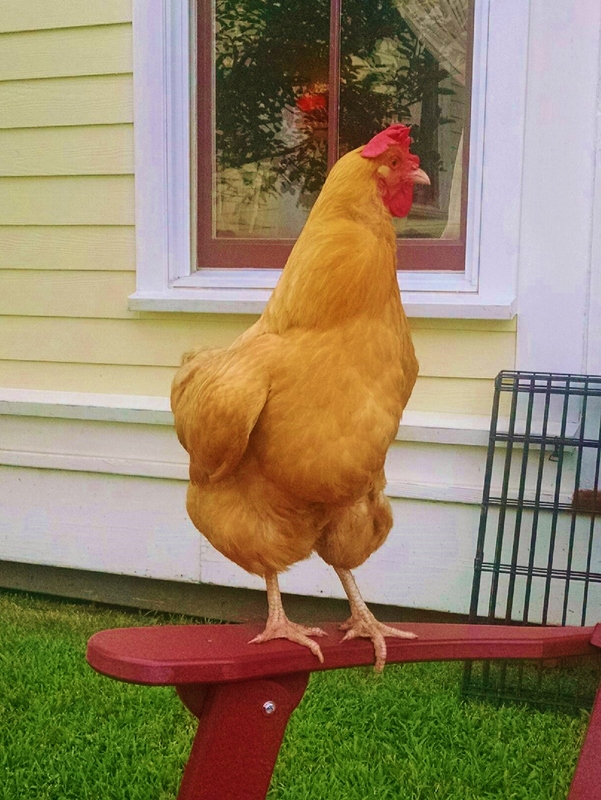 She was having some trouble getting on her roost by herself so I made her some “steps”. 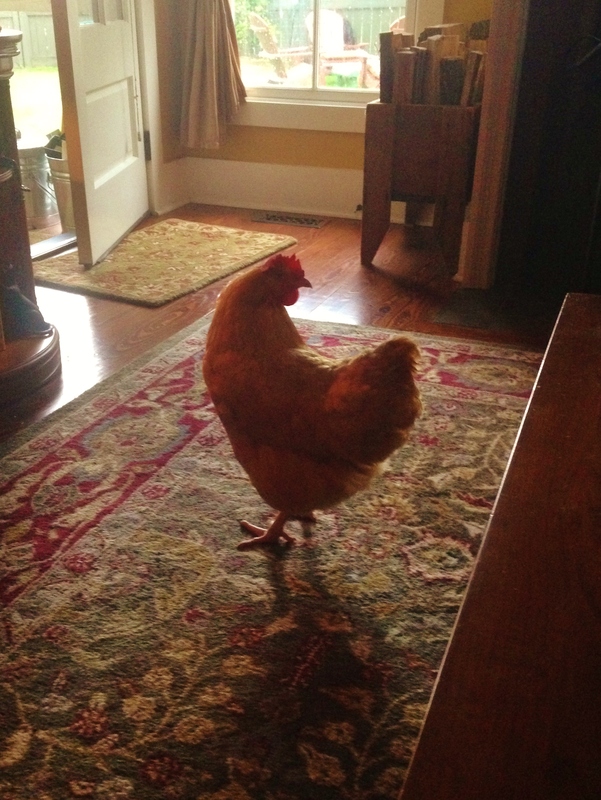 Of course I brought Daisy home to live out her chicken days with me! Debbie cried when I took her but she was happy that I was going to give my little yellow bird a life of pampering and ease in her old age. I have missed having chickens so much and Daisy has brightened up our back yard with her happy personality and bright yellow plumage! She sleeps on the porch at night for safety, but during the day when I’m home she scratches around the yard. 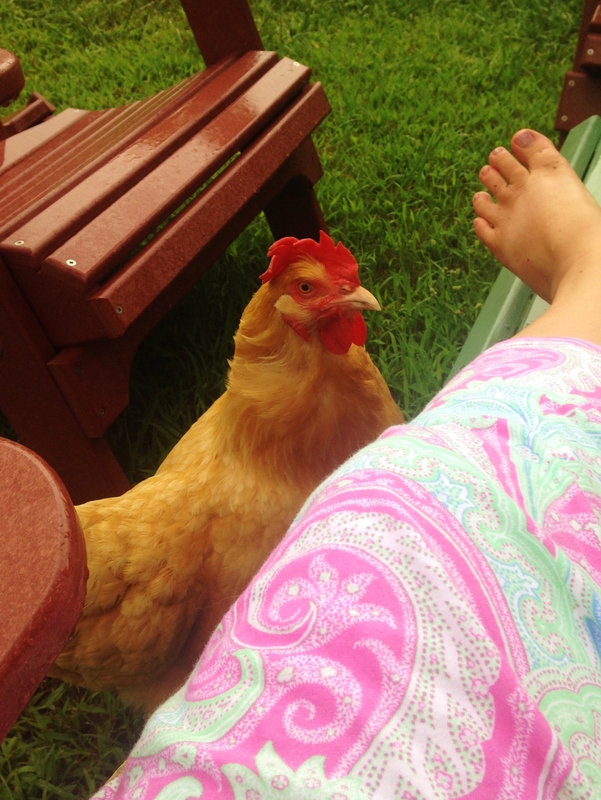 We’ve even reestablished our old routine of “chicken time” in the evenings. These chubby toes look delicious! She’s still sick and during the hottest time of the day I bring her indoors to have a break from the heat. I keep the fan on outside on the porch and she comes up there to eat and drink water several times a day. 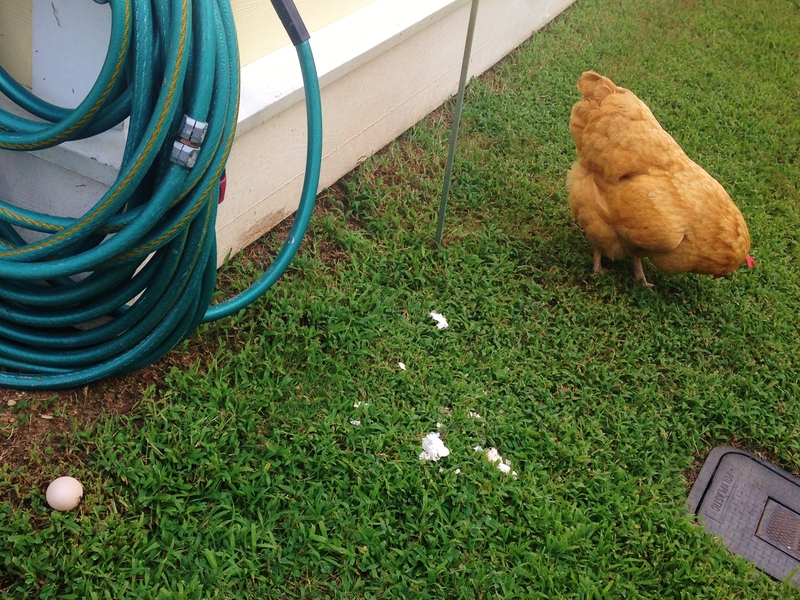 There’s also a baby pool for her in the back yard and I have lots of shade trees for her to peck around. Her breathing is great in the morning, but by noon she’s struggling and has to keep her beak open to breathe. Why does Mulder get to stay inside all day? I have an appointment for her with Dr. Glasscock tomorrow afternoon and I know she’ll fix her right up! 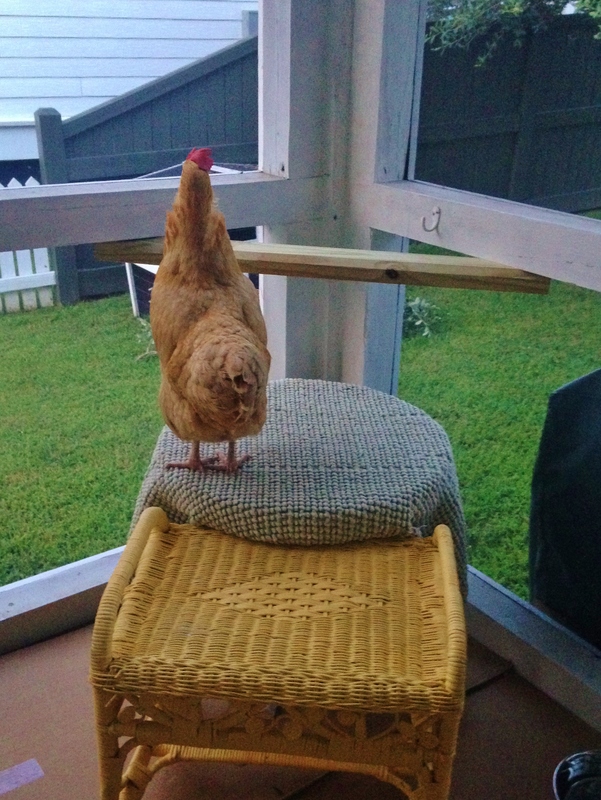 Jim made a temporary perch for her on the porch and she sleeps peacefully there all night until the sun comes up. 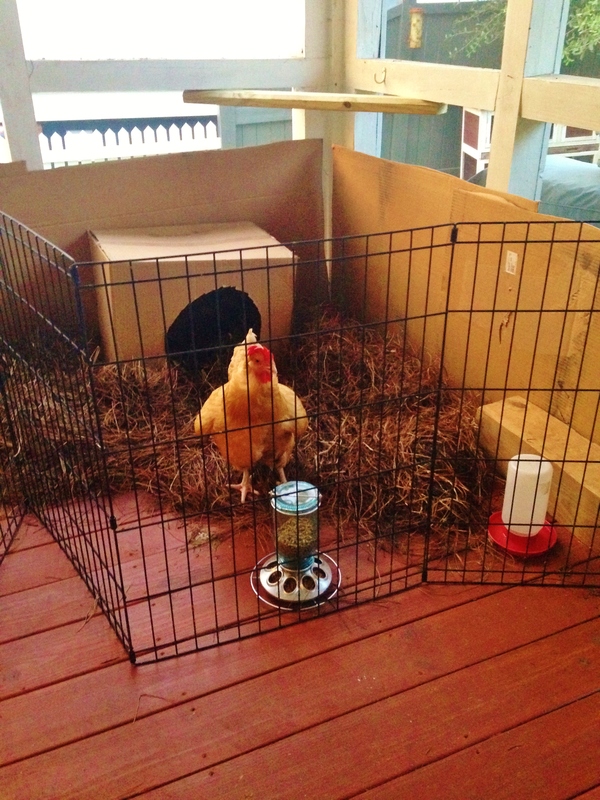 We’ve ordered a coop kit for her, but until it arrives we’re doing fine with her temporary bedroom. Daisy is already getting young visitors and I’ll post some cute pictures of Miss Sarah tomorrow. 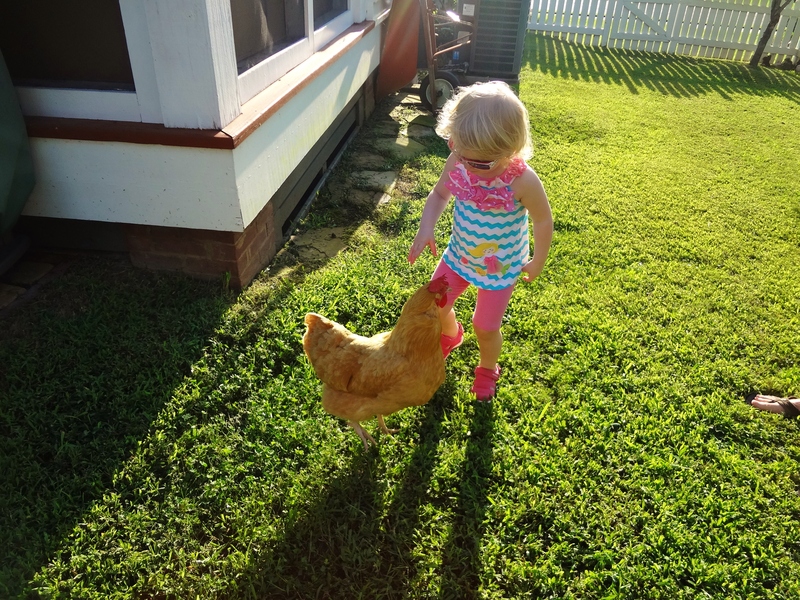 She shared her treat cup with her and I learned that chickens really love cheerios! My friend Debbie sent me a funny series of Daisy pictures I wanted to share. 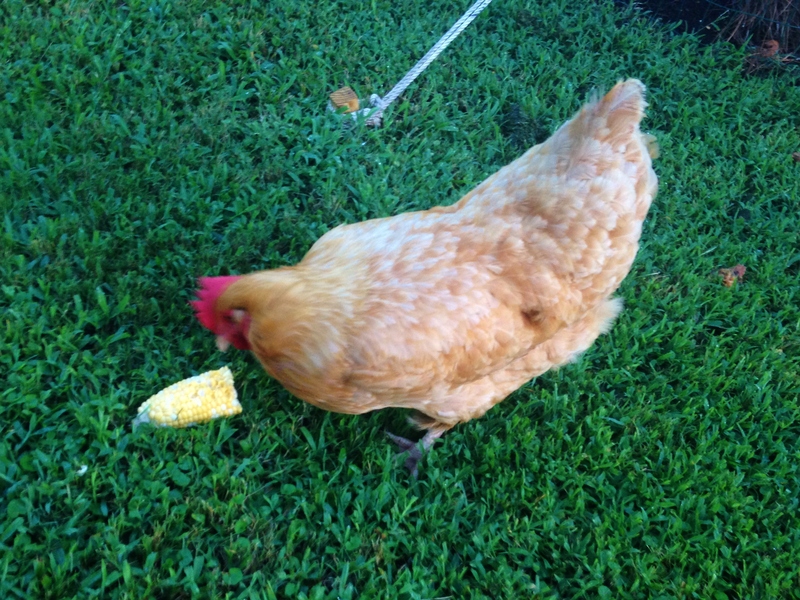 Daisy is an old lady now and she lays eggs infrequently. 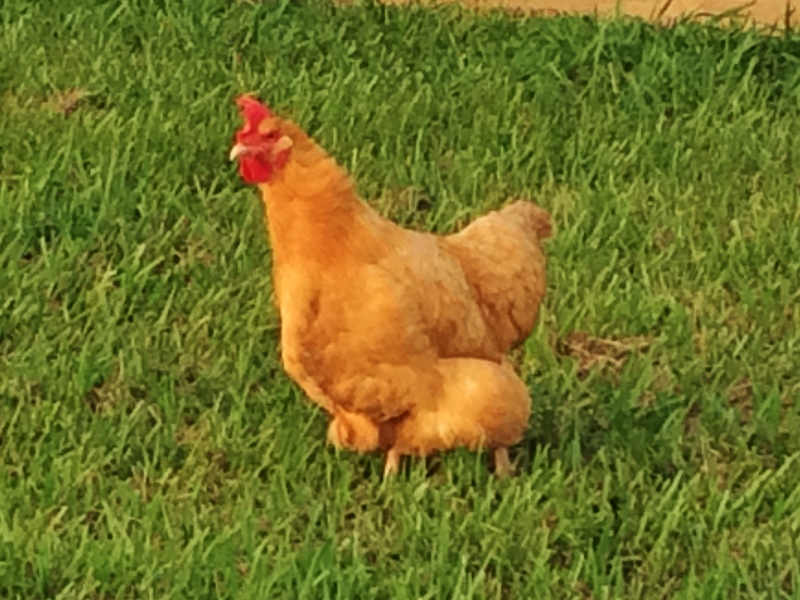 Here she is laying her egg on the go! 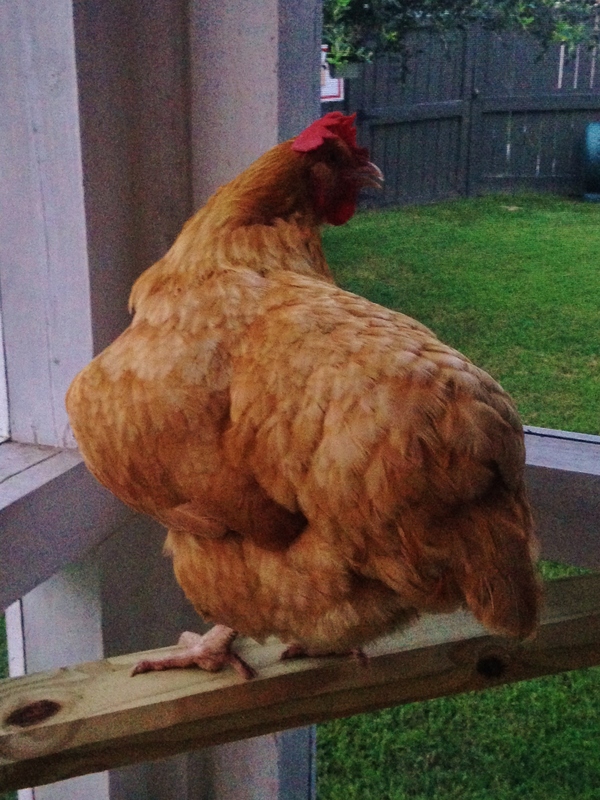 Hmmmmm…do I have time to get back to the nest box? Naaa…this’ll just take a second. Here you go mom! Enjoy your breakfast! Daisy has been sick for a long time with a respiratory infection and she wheezes when she breathes and she has a bad cough that sounds like someone stepping on a dog’s chew toy! I shot a little video of her wheezing and coughing. It’s just 30 seconds long. She coughs right at the beginning and then right before the end. It was sad to see her sick. Notice how she has to keep her beak open to breathe. Debbie suggested I take her home with me so I could pamper her and give her a fun easy life in her old age. Hmmmmmm…what do you think of THAT idea? Scrappy prepares for her “surgery”. We left the details vague, but Buster was very reassuring. You won’t feel a thing Scwappy and you’ll get some weely cool pain medicine. I left her in the very capable hands of Miss Tayunia who assured me that Scrappy would get extra special attention. This seems like a vewy nice lady. Scrappy made it thru the surgery with flying colors and came home to recover. 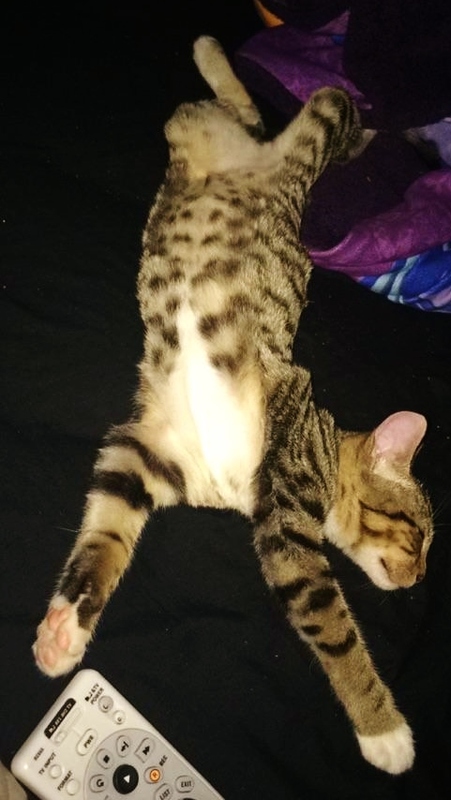 She did not act like she had just had a few organs removed from her tummy. In fact, the kid was as high as a kite and acted completely crazy! While all this activity was going on, my blog was being shared by some of my friends in my home town of Purvis, MS. One of my good high school pals (Go Tornadoes!) 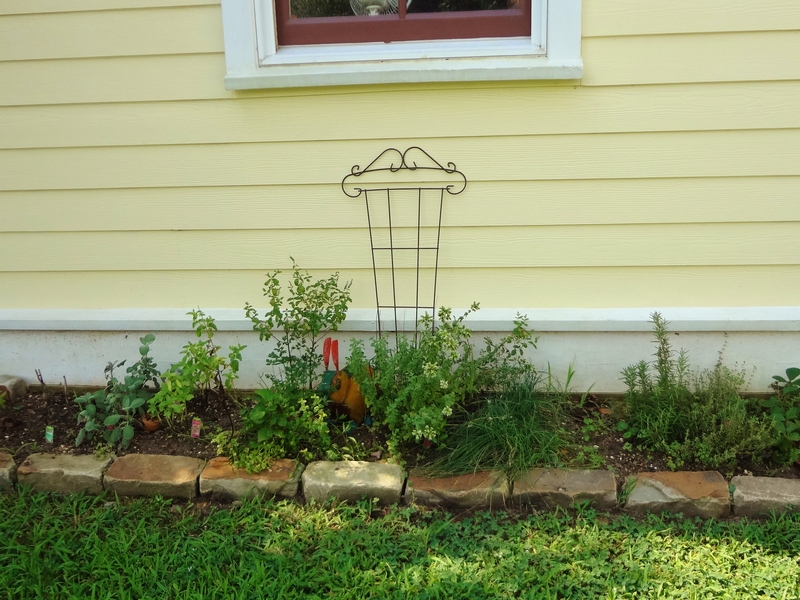 forwarded my blog to a friend who lived in Wiggins, MS. (Thank you Renee!). 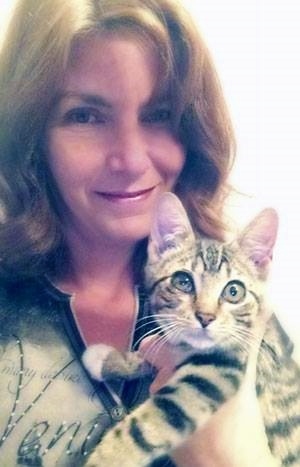 This friend was finally looking for a kitten to adopt after she had grieved for a few years over her beloved kitty who died. 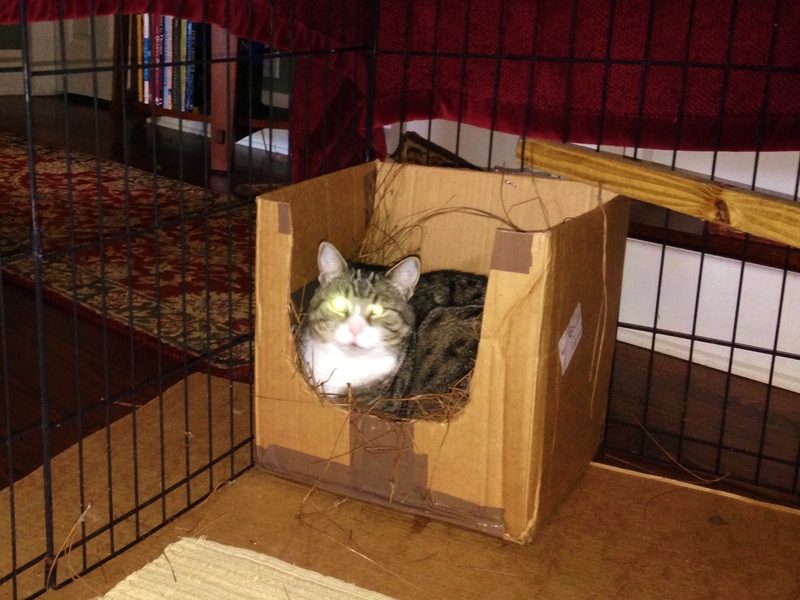 She contacted me regarding Scrappy and we began figuring out how to make this kitty hers. 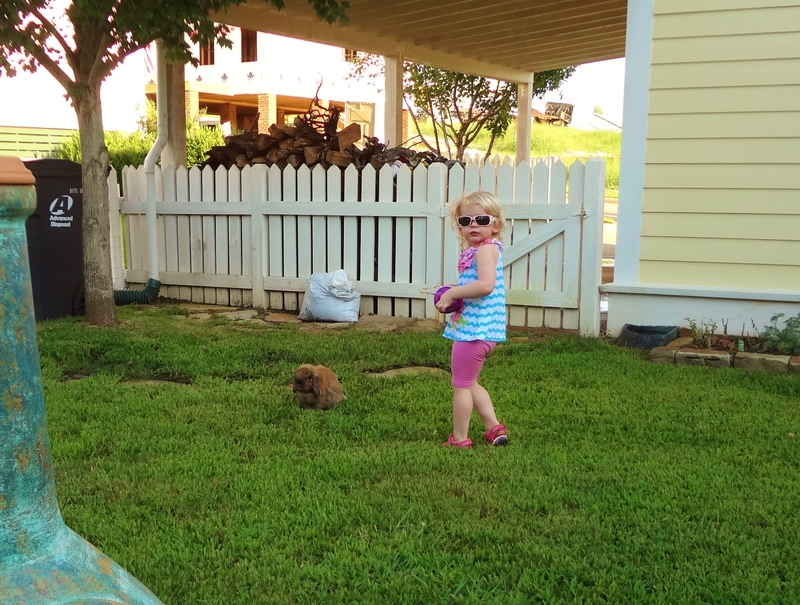 Meanwhile, my nephew and mom had arrived for a visit and we decided it would be simple for them to take Scrappy back when they go home since Scrappy’s mom actually works in Purvis. 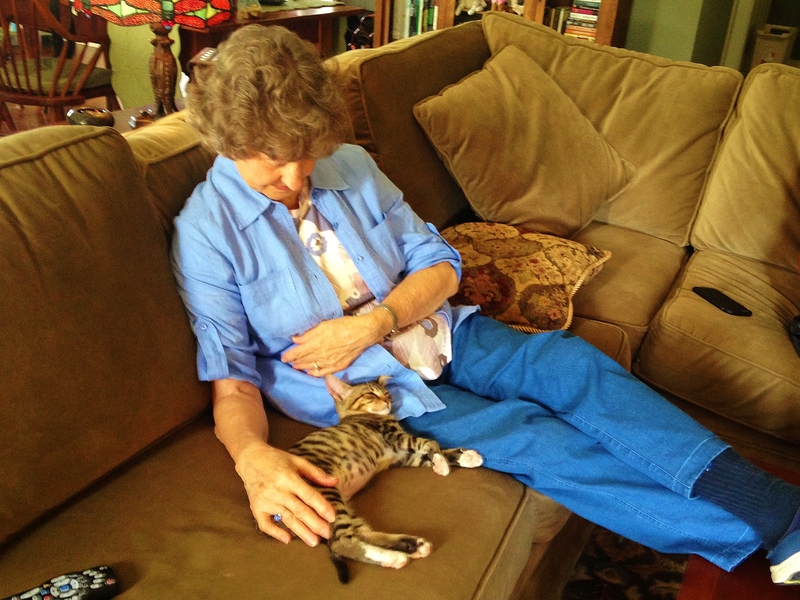 Mama fell in love with Scrappy and gave her lots of attention while she recovered from surgery. 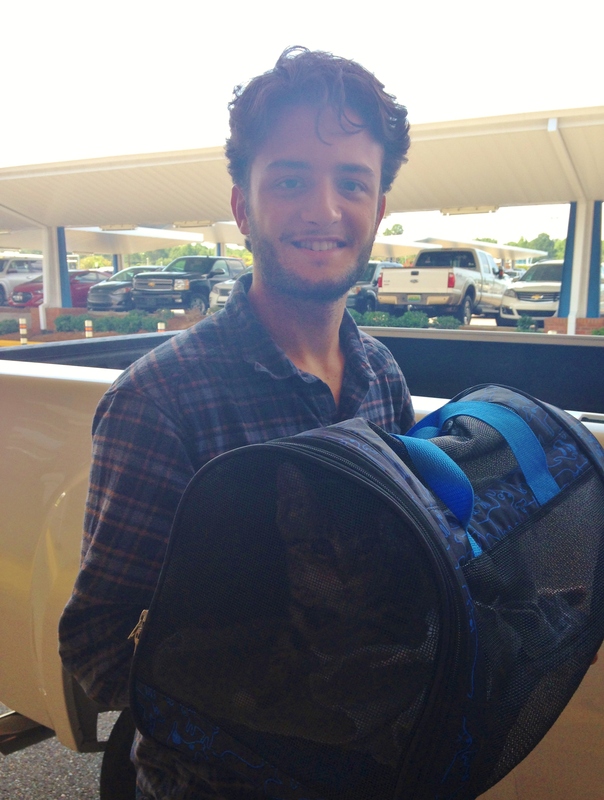 So…when it came time to go, we put the Scrapp-inator in a little carrier and Philip whisked her off to Mississippi where her new mommy was waiting for her. Sorry the picture is dark. look close to see her little face peeping out of the side. Now, I want to say a few things about how all of this happened. 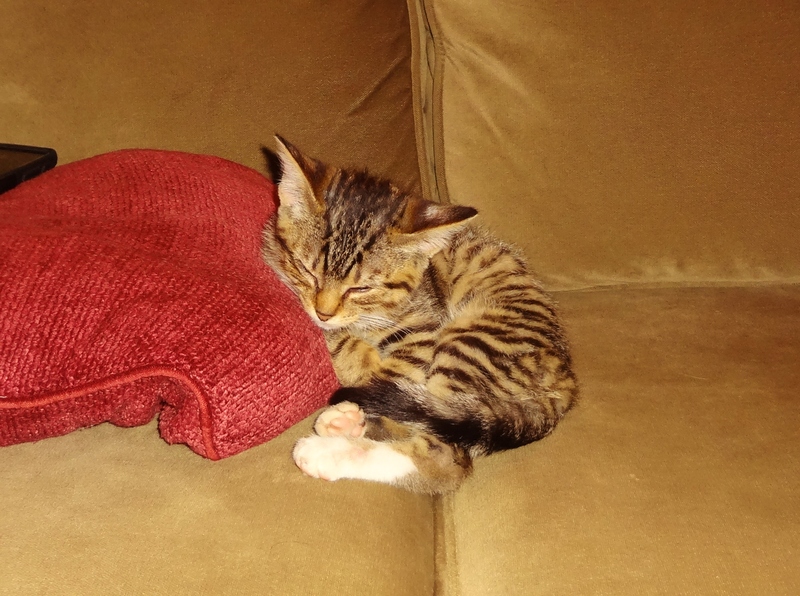 Scrappy is my most beloved foster kitten for several reasons. First, I kept this little girl for over a month. We are certain she would be dead if Mike had not brought her to us late one night after she had survived on her own for several weeks. Second, Scrappy’s personality and joy for life makes you happy just to be in her presence. And third, this is the first foster I’ve ever actually adopted out myself and been able to choose her new owner. Usually I bring my foster kittens back to the shelter and assume (hope) that they will all go to loving homes. This time I was honored to “meet” Ms. Donna G. through phone calls and email and realized that this lady would be a wonderful mom for my sweet, crazy little girl. Donna is a professional photographer as well and promises to send photos and updates of her new baby so I can share with my readers. I love my new mommy! Isn’t she pwetty? So final thanks are in order to everyone who helped make this happen. 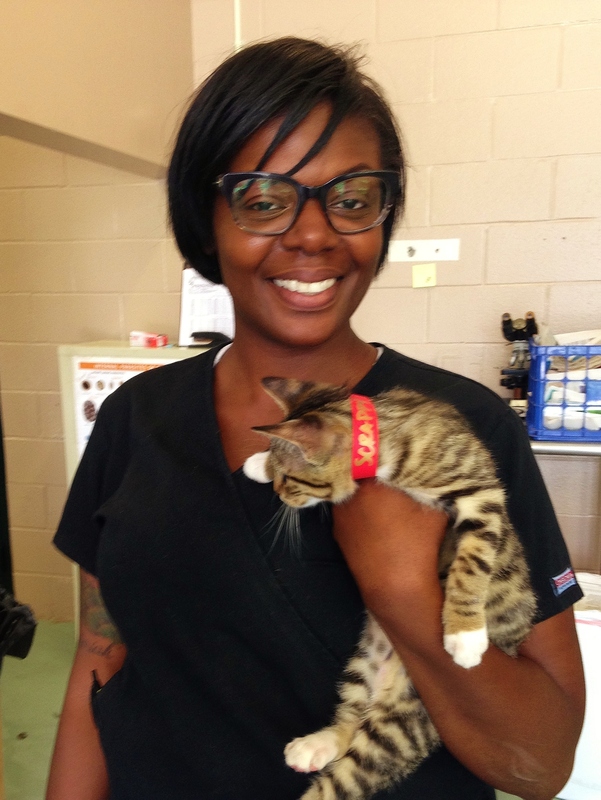 Thank you to the Montgomery Humane Shelter for shots, meds, spaying and overall support and advice. Thank you to Mike Darnell who finally was able to catch her and to all the neighbors who tried for weeks to grab her and get her help. Thank you to Goodwin Animal Hospital who treated Scrappy for a variety of problems and who gave me a discount on services because she was a shelter kitty. Thank you to the Montgomery Emergency After Hours vet on duty who absolutely saved her life the night we got her. Thanks to my wonderful pet sitters, Amy, Brenyn & Caroline who cared for her while we were out of town on two occasions. Thank you for Philip, who drove 280 miles to deliver her to her new home, and finally thank you to Jim, who gave Scrappy lots of gentle love and who footed the rather extensive bill for her medical expenses. And of course, thank you to Donna. I hope you have many years of fun with this sweet, crazy little girl. I really love a happy ending.